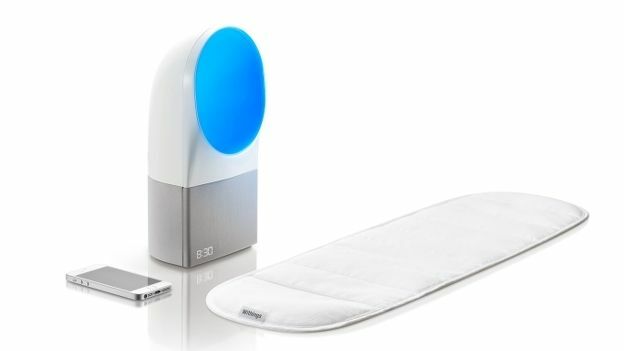 Withings has unveiled a smart sleep system called the Withings Aura, consisting of a bedside light/clock, iOS app and a sensor that is positioned under the mattress. The main unit is touch controlled, enabling users to swipe the rightside of it to raise or lower the light level, and tap the top to switch on/off and activate different pre-programmed cycles. It also contains sensors to study noise levels, room temperature and light levels, while the mattress sensor pad can track body movements, breathing cycles and heart rate to determine sleep quality. Finally, thanks tothree USB ports at the rear it can charge your phone too. If alarms need to be set (an all too frequent occurrence), the Withings Aura determines the smoothest wake cycle depending on your personal sleep profile, in theory preventing you being ripped awake from deep sleep at 6am. The Aura uses a series of light signals to gently wake you instead. It can also be controlled via an iOS app which records the quality and duration of sleep, then provides recommendations based on the data. In a demo at CES we were impressed by the build quality and design of the Aura, and the touch sensors were very responsive and slick. The Withings Aura system will be available in Spring, for around £180.